In March this year, the leaders of 44 African countries endorsed the African Continental Free Trade Agreement (AfCFTA). Since then more countries, including Africa's second largest economy, South Africa, have joined in. Th agreement is expected to favour small and medium-size businesses (SMEs), which are responsible for more than 80% of Africa’s employment and 50% of its GDP. Obviously, any economic policy that facilitates imports and exports among member countries - with lower or no tariffs, free access to the market and market information, and the elimination of trade barriers - offers numerous benefits to SMEs. And as history's largest free trade agreement, which has a market size in the region of USD$3 trillion, most people are excited at the development. But skeptics have pointed to impending challenges, especially those which affect SMEs. These must be addressed if the AfCFTA is to achieve its objectives. But first, let’s look at who stands to gain. Global companies have more expertise than domestic companies to develop local resources. That's especially true for businesses in the manufacturing sector. The AfCFTA will allow multinationals to partner with local firms to develop raw materials, training them in best practices and transferring technology in the process. A major potential challenge in harmonising Africa’s heterogeneous economies under one agreement is the wide variation that exists in their levels of development. 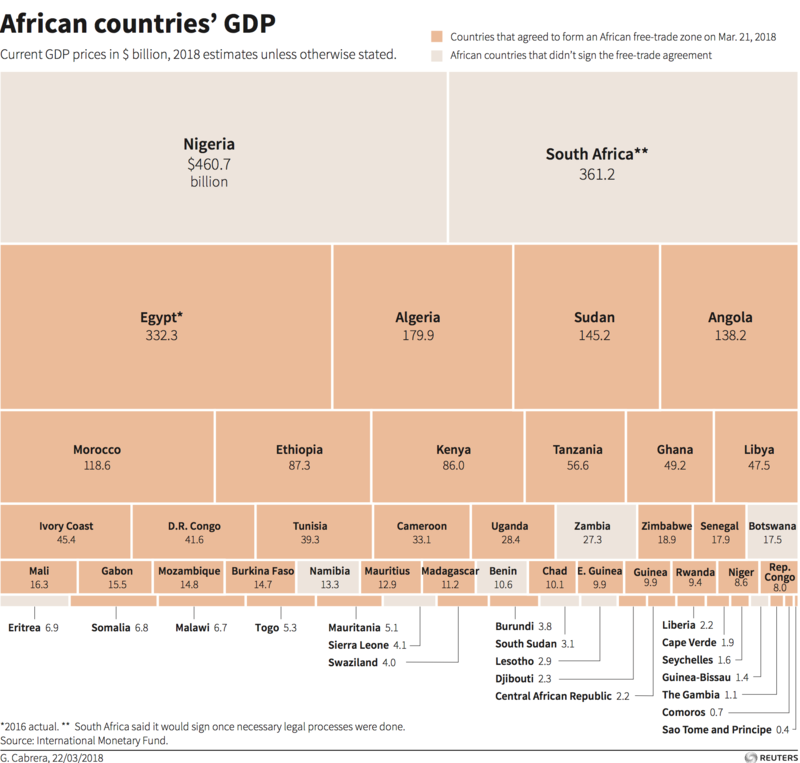 For example, over 50% of Africa’s cumulative GDP is contributed by Egypt, Nigeria and South Africa, while Africa’s six sovereign island nations collectively contribute just 1%. The AfCFTA has the greatest levels of income disparity of any continental free trade agreement, and more than double the levels witnessed in blocs such as ASEAN and CARICOM. Many emerging African markets are traditional economies that rely on farming for employment. These small family farms can't compete with large agri-businesses in high-income African countries such as South Africa, Kenya, Ethiopia, Egypt and Nigeria. As a result, they may lose their farms, leading to high unemployment, crime and poverty. Consumers always prefer cheaper products. This may lead to local producers losing huge sales to foreign suppliers, because the latter can lower the cost of their products by leveraging the reduced tariffs imposed on imported goods. Labourers from poorer countries may be forced to work long hours and to live in shanties without basic amenities such as drinking water and electricity, in order to send money to their families. Some workers might even be forced to accept lower wages and be prevented from joining labour unions, under threat of losing their jobs. Tough competition may lead some companies to disregard the environment when it comes to making products and disposing of waste, just so they can survive in their industry. Many SMEs are likely to cut costs, including those related to manufacturing and the proper dumping of waste. Many African countries don't have laws in place that protect patents, inventions and new processes. The laws they do have aren't always strictly enforced. As a result, companies' ideas often get stolen. With the AfCFTA, this could get worse, leading SMEs to invest poorly in research and development. Without comprehensive policy-making and preferential treatment for Africa’s most at-risk economies, the AfCFTA could prove to be a force for economic divergence, rather than a force for good. It is therefore important that participating countries build an efficient and participatory institutional architecture to avoid leaving any economies behind. To increase the impact of the trade deal, industrial policies must also be put in place, especially those concerning SMEs and manufacturing. These must focus on productivity, competition, diversification and economic complexity. Furthermore, individual countries under the agreement should introduce policies that address the concerns of labour unions, encourage healthy competition without killing local businesses, ensure strict adherence to waste disposal and protect intellectual property.